With just two weeks until the Breeders’ Cup World Championships returns to Churchill Downs for a record-equaling ninth time, locally-based contenders Mind Your Biscuits, Seeking the Soul, Thunder Snow (IRE), Whitmore and Wonder Gadot logged their penultimate breezes for the Nov. 2-3 championship event on a chilly Friday morning beneath the historic Twin Spires. Whitmore is likely to be pre-entered in both the Dirt Mile and Sprint, according to Moquett. 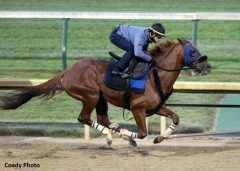 The post Mind Your Biscuits ‘Perfect,’ Thunder Snow ‘Fresh’ Ahead Of Breeders’ Cup Engagements appeared first on Horse Racing News | Paulick Report.